7. Reflecting on the fact that his platitudes and stories don’t hold his children’s interest, the elderly Jacob notes, “My real stories are all out of date. So what if I can speak firsthand about the Spanish flu, the advent of the automobile, world wars, cold wars, guerrilla wars, and Sputnik—that’s all ancient history now. But what else do I have to offer?” (page 110). How might we learn to appreciate the stories and life lessons of our elders and encourage people younger than ourselves to appreciate our own? 10. As he lies on his bedroll, after his night with Barbara and Nell, Jacob cannot empty his mind of troubling visions, and he reflects that “the more distressing the memory, the more persistent its presence” (page 143). How might the elderly Jacob’s memories corroborate or contradict this observation? What have been your experiences and observations in this regard? 14. After the collapse of the Benzini Brothers circus and Uncle Al’s having “done a runner” (page 314), Jacob realizes, “Not only am I unemployed and homeless, but I also have a pregnant woman, bereaved dog, elephant, and eleven horses to take care of” (page 317). What expectations did you entertain for Jacob and Marlena’s—and their menagerie’s—future after they leave the Benzini Brothers circus? How do the elderly Jacob’s memories of Marlena and their life together confirm or alter those expectations? 15. At the end of the novel, Jacob exclaims, “So what if I’m ninety-three? . . .why the hell shouldn’t I run away with the circus?” (page 331). What would you project to be the elderly Jacob’s experiences after he runs away with the circus the second time? How does his decision reflect what we have learned about his early years? 16. Sara Gruen has said that the “backbone” of her novel “parallels the biblical story of Jacob,” in the book of Genesis. On the first night after his leaving Cornell, for example, Jacob—as did his biblical namesake—lies “back on the bank, resting my head on a flat stone” (page 23). 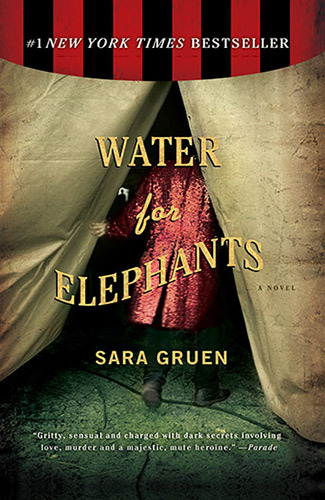 In what other ways does Water for Elephants parallel the story of the biblical Jacob? How do the names of many of the characters reflect names of characters in the biblical account?